Walter Miller studied history at college, built a successful business dealing in automobile literature, and made a hobby of world travel. 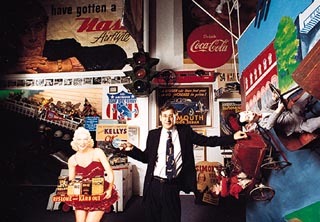 He drew from all of these interests in assembling the Walter Miller Automobile Memorabilia Collection which was first opened to the public at The Museum of Automobile History in Syracuse, New York. That collection traces the first century of the automobile, and the amazing changes it wrought on life around the world. The museum and The Miller Collection are now located in North Carolina. Mr. Miller grew up in DeWitt, New York, a suburb of Syracuse. Looking at a couple of picture-books that his father had on automobile history, he became fascinated with the subject as a boy of just five years. He started on his later career as a dealer of automobilia when he was a teen-ager by buying a box of LIFE magazines at a garage sale. He pulled out the automobile ads, and then sold them for a nice profit … even at a quarter a piece. After graduating from the State University of New York at Binghamton with a major in management and a minor concentration of history courses, he enrolled in a masters-degree program in business administration at McGill University in Montreal. Afterward, Miller decided to try to build a business of his own. The choice to deal in literature connected with cars was a natural one, even though it meant turning down a career opportunity with a Fortune 500 company. Most of the material known as “automobile literature” was produced by the car companies themselves: sales brochures, repair manuals, and showroom items. The term does not refer to books written about cars, nor to reprinted or newly printed items, but to original source material. Walter Miller’s automobile literature business has grown to be the largest in the world, with over 2,000,000 pieces in stock. In building the company through the years, Miller purchased several major collections that also became part of his own collection, now owned by The Museum of Automobile History. One of the first was the personal library of Floyd Clymer, the most well-known publisher of automobile books from the 1930’s to the 1960’s. The library included personal letters written to Mr. Clymer by such notable figures as Ransom E. Olds and Henry Kaiser. Another major collection that was acquired is that of the late J.L. Elbert, the author of a respected book on the Duesenberg. A resident of a small town in Missouri, Mr. Elbert was dedicated to the beauty and importance of automobilia. His collection included, among other things, showroom brochures from nearly every automobile made from his youth during the 1920’s until the 1970’s. His house was literally filled to the brim! In fact, the collection filled two tractor-trailers when it was moved. Walter Miller had originally dedicated The Museum of Automobile History to the memory of J.L. Elbert. Walter Miller travels extensively and has been to at least fifty countries. He has driven to California and back ten times, and has been around the world twice. Along the way, his eyes are always open for items related to the automobile. “I was in Russia for a month,” he recalled, “And I took the trans-Siberia railway. Everytime the train stopped, there’d be peddlers waiting, and everytime, I’d get a little Russian car – about twenty different models, of cars which aren’t even being made anymore.” The Russian models became a part of his collection. At a street market in front of the Red Fort in New Delhi, India, one of the vendors had some antiques for sale. Rummaging around, Miller found a tabletop automobile, handmade in brass to hold spices. He judged that it was from the 1910’s, when India was part of the British Empire. “In Mexico one time, I saw some peasants selling religious icons, some of which were shaped like cars – cars filled with skeletons!” Miller recalled. Anything at all that reflects people and their connection to cars was of interest – including the icons. As a historian, he sees the serious purpose behind the fun of the items that he collected. He points out that there is no collection like it anywhere else. There are no cars at this automobilia collection. That fact, by itself, makes a bold statement. To Miller, the automobile is the single most important invention of our time, maybe of all time, and its effect can be seen most accurately in the items that people have made to reflect it: “I don’t believe that autos themselves reveal, or teach, you as much about history as the items that surround them,” he maintains. As the collection of one man, drawn together through more than thirty years and from several continents, Mr. Miller’s collection, currently housed at The Museum of Automobile History in North Carolina, is an individual reaction to the monumental influence of the car. It is not the selection of a committee or an institution, but it is a memorable automobile trip, for Miller and everyone who has been able to see the collection. With the overlapping sensibilities of a collector, a historian, and an international traveler, Walter Miller has been uniquely equipped to amass a collection of automobilia that is not only the largest in the world, but one that has the scope and detail to become a true Museum of Automobile History. Selected images from the Miller Collection and the museum when it was located in Syracuse are available in the Miller Collection Website Gallery in the Activities section.